I had a chance to get out with a buddy of mine and do some shooting – just for fun, for a change. 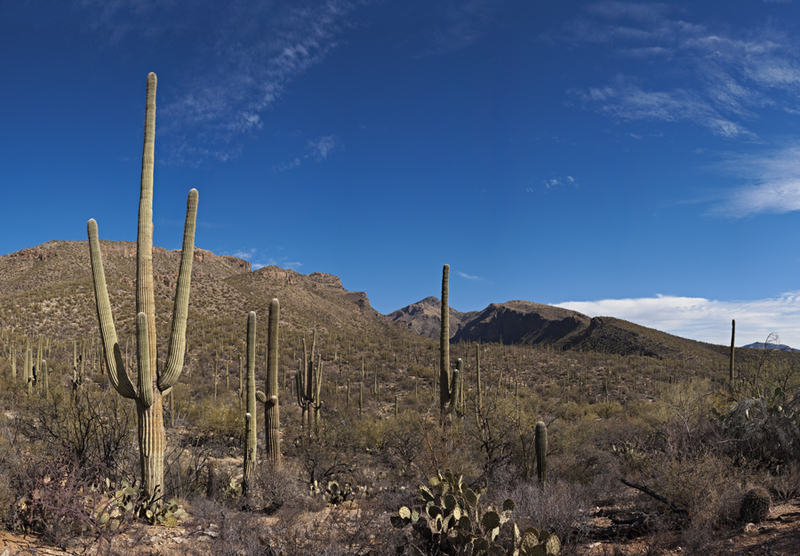 As beautiful as the weather was, we thought it would be a perfect day to head up to Sabino Canyon, just north of Tucson. Sixty-nine degrees, light breeze – can’t ask for better than that. It’s hard to believe that someone somewhere was shoveling snow. This is a two-row, ten-image panorama stitched together with Microsoft ICE. Final image size is 32″ x 22″. This vacation trip has been some time in the making for me. Having had lower back surgery in 1997, this would be the first trip in a dozen years on which I would plan on driving for more than a couple of hours at a time. Lola and I had been to Colorado was in May, 2005, but we had flown in to Denver on that trip – the primary purpose being to visit my father in Idaho Springs. That trip had left little time for travel to the surrounding areas and I looked forward on this year’s trip to being able to take in more of the beautiful scenery around the state and to make it more of a photographic expedition. Max Lyons has just recently posted an update to PTAssembler, his popular panoramic and high resolution image mosaic creation software. This program give tremendous control over the output of stitched and stacked images and is the software I use for my larger or more complicated panoramas.